The recent surge in oil prices is poised to boost global assets as crude-producing states deploy replenished stashes of petrodollars, according to a growing chorus of analysts. 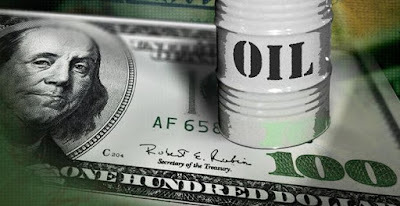 It’s the potential reversal of part of the global "quantitative tightening" that was said to have occurred as oil prices dropped precipitously, and could amount to an extra shot of liquidity at a time when central banks are beginning to normalize monetary policy. "The increase in oil prices is generating a shift in flows and incomes across the world, effectively reversing the previous big shift seen between 2014 and 2016," wrote JPMorgan Chase & Co. analysts led by Nikolaos Panigirtzoglou. They estimate that energy producers stretching from the Middle East to Norway saw their oil-related revenues plunge from $1.6 trillion in 2014 -- when crude reached $115/bbl -- to less than $800 billion in 2016, when it fell to $27. With central banks having to switch over from Quantitative Easing to Quantitative Tightening due to the fact that half a decade of lower oil prices have forced them to have to print tens of trillions of dollars to sustain a modicum of liquidity to stave off deflation, markets are cheering the return of higher oil while at the same time it becomes a Damocles Sword over consumers who are fully tapped out, and in more debt today than during the 2008 financial crisis.